For the fourth consecutive year, an ASU student is a finalist in Entrepreneur magazine’s annual competition. 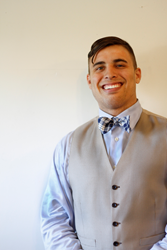 ASU graduate student Anthony Gonzales, co-founder of Force Impact Technologies, is a finalist in Entrepreneur magazine's 2014 College Entrepreneur of the Year competition. Anthony is a model entrepreneur because of his ability to identify challenges and develop real-world solutions that he and his team can implement. Arizona State University graduate student Anthony Gonzales, co-founder of Force Impact Technologies, has been named one of five finalists in Entrepreneur magazine’s 2014 College Entrepreneur of the Year competition. This is the fourth consecutive year that an ASU student has been a finalist in the competition. Jared Schoepf, co-founder of SafeSIPP, and JJ Tang, co-founder of Vantage Realized, were finalists in 2013 and 2012, respectively. In 2011, ASU dominated the competition: Three of the five finalists were ASU students, with G3Box co-founder Gabrielle Palermo winning top honors. The winner of the 2014 competition will be determined by the results of a public vote in combination with the votes of a panel of judges. The public can vote online at http://www.entrepreneur.com/e2014college through Sept. 19. The winner will be announced in the magazine’s January 2015 issue. Gonzales, an MBA student in ASU’s W. P. Carey School of Business, was motivated to start his company after suffering a concussion during a collision in a collegiate rugby game. He didn’t have any typical concussion symptoms immediately following the incident, and with no idea that he had just sustained a serious head injury, he attempted to keep playing. Fortunately for him, his teammate, a trained EMT, recognized the possibility of concussion and intervened. Determined to help other athletes minimize the risk of head injuries, Anthony joined forces with W. P. Carey alumnus Bob Merriman to found Force Impact Technologies (FIT). The company’s first product is the FITGuard, a mouth guard for athletes that integrates force-detection technology. FITGuard measures the force of an impact and illuminates when the force exceeds a set threshold, giving athletes, coaches and trainers a visual signal that a player has been subjected to a level of force that could cause a head injury. FIT is supported by ASU’s Edson Student Entrepreneur Initiative, which provides funding, office space, training and mentorship to help student entrepreneurs launch their ventures. In April 2014, FIT won the second annual Arizona Collegiate Venture Competition, beating out 11 other startups from ASU, Northern Arizona University and University of Arizona to win a $10,000 cash prize. The company also won second place in ASU’s 2014 Innovation Challenge, earning a $7,500 cash prize. The Edson Student Entrepreneur Initiative gives Arizona State University’s student entrepreneurs the opportunity to develop their innovative ideas and launch viable startup companies. The initiative provides funding, office space, training and mentorship to help students launch their ventures.